She thought the shirt was funny when she bought it because school has not been a whole lot of fun for her. 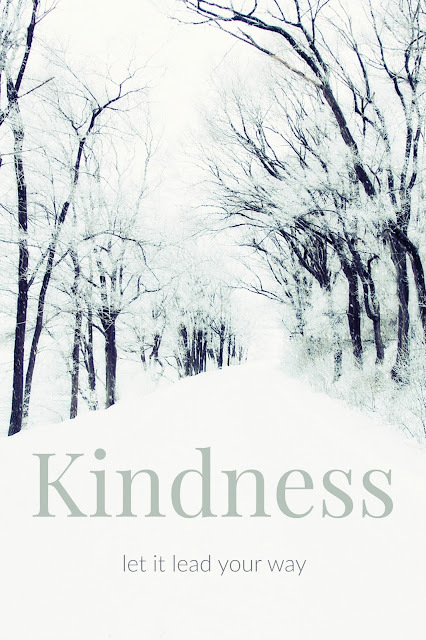 She's suffered the mental anguish of being bullied, and all the normal dramas of High School. Quite frankly, she can't wait to be done with school, but she's hanging in there rather than just dropping out. We knew not everyone would find the humor in it, but we never thought it would result in her picking up trash as punishment for wearing it. My youngest daughter, a Senior in High School received 5 days of lunch duty for wearing a shirt that the Principal deemed to be a violation of dress code, not because it was too revealing, not because it was gang related, or profane; but because it did not display a "positive message." Really?! Where's that in the student handbook?! Come on lady, what's the harm in expressing yourself a little bit?! What's more positive than laughter? 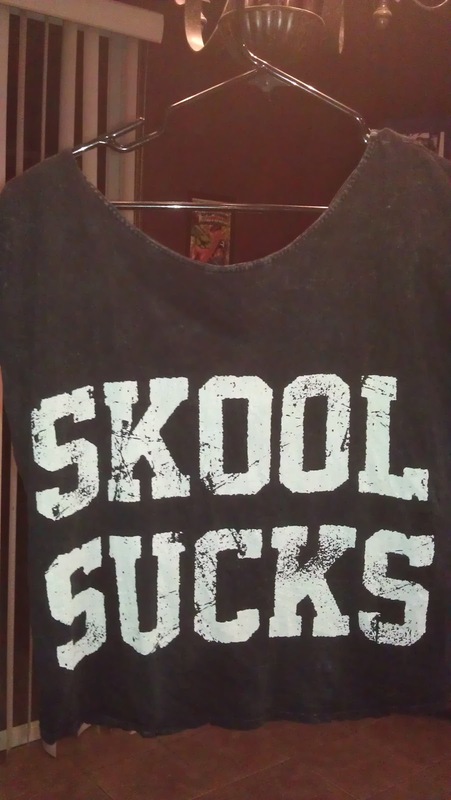 A shirt that can't spell school properly is just funny. So stop hating and just laugh at it. There are way more important things than worrying about a shirt not being positive enough! Like, hmmm, I don't know, how about putting a stop to bullying?! By the way, my daughter can spell school properly. 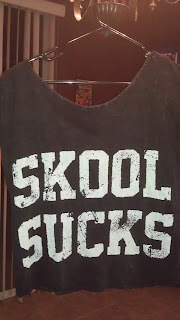 It was a rule before she could wear it, because it's not funny if you can't really spell school, not funny at all. omg I can't believe she got in trouble for that!! Sounds like that principal needs to be reported!! Omg she would seriously FAINT if she came to one of the schools where I live!! !